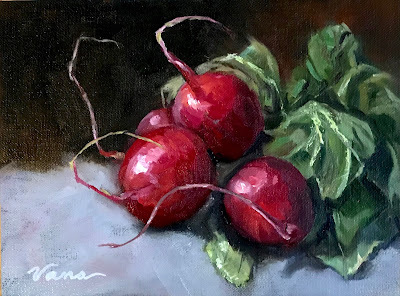 This is a simple radish study painted on a Raymar Art Linen Panel. I enjoyed this so much that I decided to paint a series of these. However, the leaves wilted quickly so I will need to buy many more radish bunches. Also, my youngest cat Sophie tried to eat the leaves and managed to break a few off. Such is the life of a cat owner artist! So now I have two favorite edible still life objects: lemons and radishes.